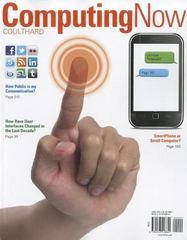 ComputingNow 1 Edition McGraw-Hill's Computing Now! 2012. Computing Now! 2012 offers students of today an engaging resource designed to provide current, intriguing information about computing concepts. With society's ever-changing technology, isolating need-to-know information is imperative so that only accurate, realistic concepts are emphasized. Computing Now! provides a fresh new design via its magazine- style approach to enhance student learning and bring these important concepts to life! Computing Now! 2012 also correlates with SimNet Online, our online training and assessment program for Microsoft Office 2010 skills and also computing concepts!